This is the 1999 Italian paperback edition of The First Eagle, the thirteenth Tony Hillerman Navajo Mystery novel featuring Joe Leaphorn and Jim Chee of the Navajo Tribal Police. This edition was published by Piemme in Casale Monferrato, Italy. The text was translated into Italian by Maura Parolini and Matteo Curtoni. The title translates to "The Mystery of the Indian Reservation." Format: Paperback, 23 x 14.7 cm. Binding: Paper covers with sepia toned picture and title printed in red. 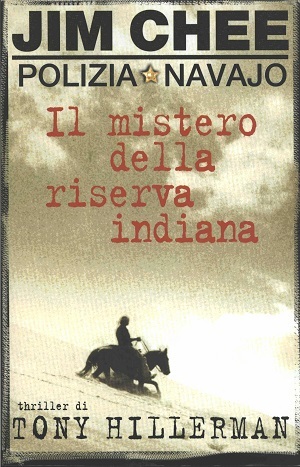 "Jim Chee Polizia Navajo", a picture of a badge, the title, author and publisher are printed on the spine.